Periodically, otherwise very expensive cuts of meat such as rib-eye steaks are available for greatly reduced prices. 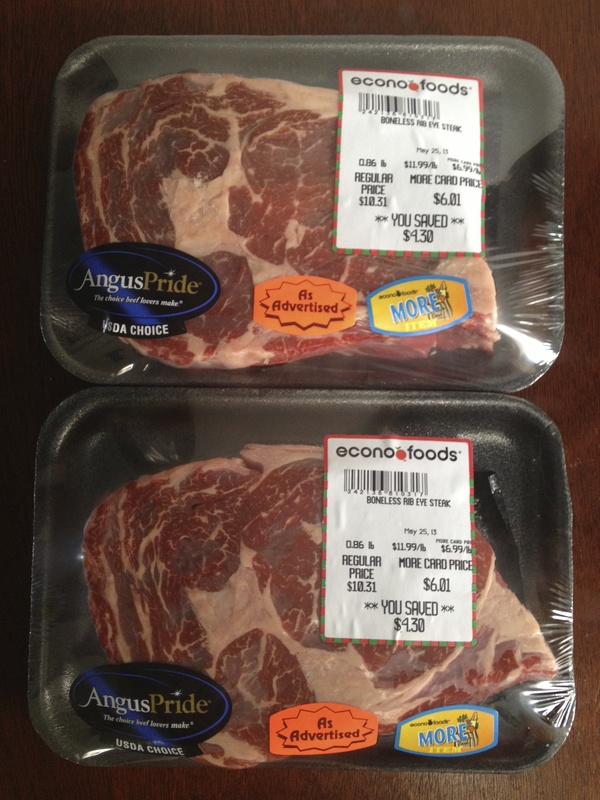 Recently, rib-eyes which are normally $11.99/lb. were available for $6.99/lb. (41.7% off). Rib-eye steaks that are normally $11.99/lb. were on sale for only $6.99/lb. Does it make sense to stock up on rib-eye steaks when they are on sale, then freeze them to be consumed later, or does freezing damage the steaks too much? Based on a previous experiment, there was little to no difference between fresh and frozen steaks, however in that experiment both steaks were less than spectacular, calling into question the original quality of both steaks. In this experiment we’re starting with two fresh steaks from a source we expect will be of higher quality. Since we’ll be starting with higher quality meat, we expect to see a greater difference. In particular, we expect the frozen steak to suffer more cellular damage and therefore lose more mass during cooking, possibly leading to tougher meat. Remove both from their packaging. Place each steak into its own zip-top bag, getting as much air out as possible (a straw can be useful for this). Place one steak into the freezer, the other into the meat drawer of the fridge. Wait until steak in the freezer is completely frozen. Thaw frozen steak in a water bath. Prep steaks for cooking according to Alton Brown’s recipe. Cook both steaks according to the recipe. Each steak was massed then placed into a zip-top bag for storage. The masses and storage method were written on the bags. Below are pictures of the steaks at each phase of the freezing/thawing process. The upper left image is before one of the steaks was frozen. The upper right is the next image which shows the steaks after one had been thoroughly frozen. The lower left, shows both steaks after the frozen one had thawed in a water bath. To ensure that both steaks started at the same temperature for cooking, the non-frozen steak was also placed into the water bath during the thawing process. This turned out to be a non-issue however as the cooking was delayed until the next day and both steaks were placed in the refrigerator over night. The final picture in the lower right is the steaks after they both spent another night in the refrigerator, and was taken shortly before they were cooked. Meat in various stages of storage. The fresh steak is always on the left, the frozen steak is always on the right. A) before being stored, B) before thawing frozen steak, C) immediately after steak thawed, D) after another night in the refrigerator. For comparison, photos of the steaks before and after they went into storage for a couple days were taken. The steak that was not frozen is noticeably browner than the steak that was frozen. This differs from previous observations in which frozen steaks were thought to be browner than fresh. So, we surmise that the steaks that can be purchased frozen were turning brown before they were frozen. This is further bolstered by the vacuum sealed beef we’ve had in our freezer for months that is still very red. Rib-eye steaks before and after storage. The left picture shows both steaks before. The right picture shows both steaks after. Within each picture, the steak on the left was stored in the refrigerator, the steak on the right was frozen and thawed. Once the steaks were cooked, they were both sliced in half to examine their cross sections as show below. There was little different between the steaks in terms of color or doneness. Rib-eye cross sections. Top: fresh rib-eye. Bottom: frozen rib-eye. At several stages during the storage and cooking process the mass of each steak was recorded. The table below gives both the raw values and percentage of mass lost. In the prepped stage, both steaks gained a slight amount of mass due to the addition of canola oil and salt. When graphed the masses of the steaks follow very similar trends. A slight loss in mass during storage, followed by an increase during preparation due to the addition of oil, then a significant loss during cooking. Steak masses over the course of the experiment. When the loss is taken as a percentage of the original mass of each steak, the results are somewhat surprising. The mass lost during storage is nearly identical, as is the gain during preparation. However the fresh steak loses more mass during cooking than the frozen one. This is the opposite of what was expected. Percentage of mass lost over the course of the experiment. When the steaks were tasted, both had nearly identical texture and juiciness. The only major difference was the flavor. The fresh steak had a much stronger beefy flavor than the frozen one. More science will need to be done to determine the cause of this difference. Both steaks were very enjoyable, and far superior to the steaks in the previous fresh versus frozen study. Despite asking Brownie-Master P and Taste-Tester K over to help taste test, both declined, leading to left overs. Also the improved flavour of the fresh steak was much greater than expected. 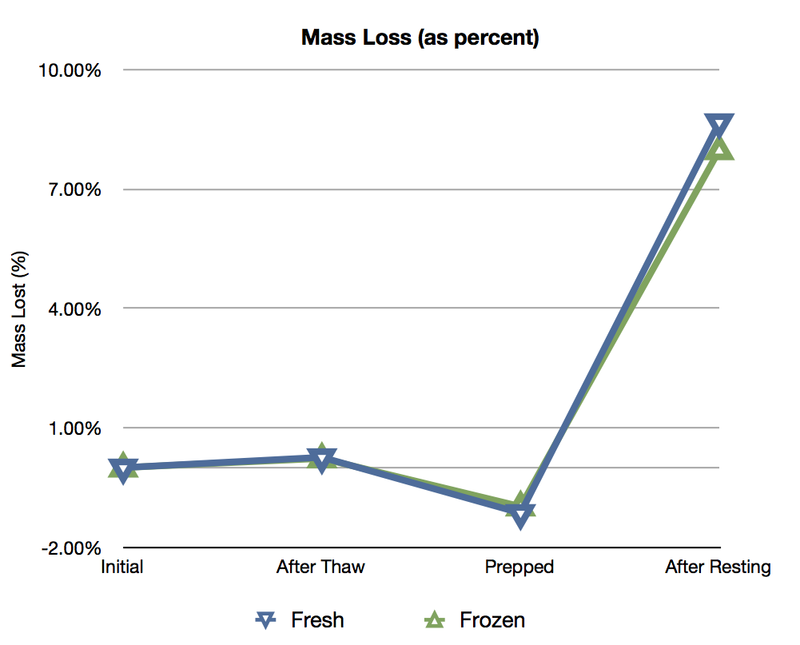 The fact that the fresh steak losing a larger percentage mass was also surprising. 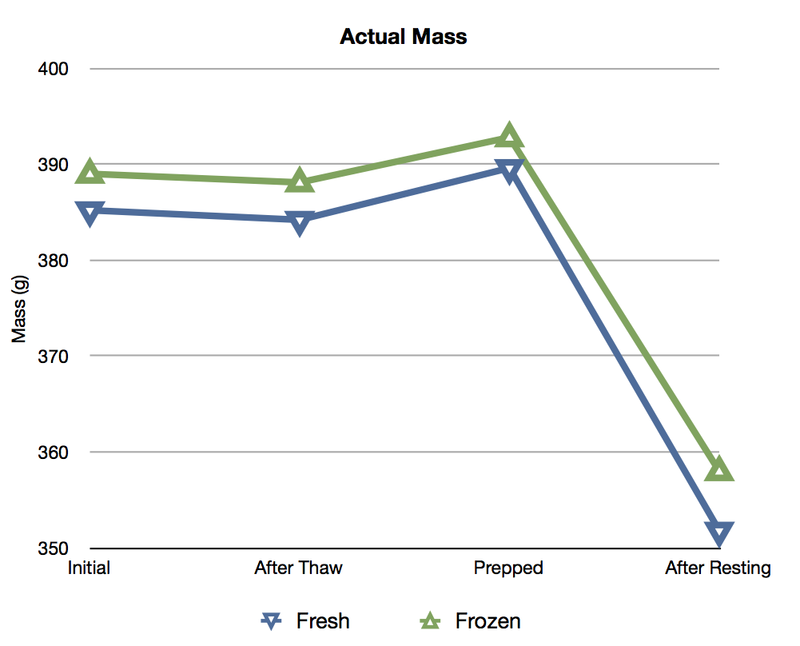 The difference in mass loss was very small between the two steaks was very small, in fact the frozen steak, which was expected to lose more mass actually lost less mass during cooking. Both steaks had nearly identical textures, however the fresh steak did have a more pronounced beefy flavor. Both steaks were very good, and only had a slight difference in flavor. So at least for short periods of time, there is little difference between freezing steaks and keeping them in the refrigerator, indicating that the process of freezing and thawing alone does not significantly alter the steaks. If the frozen steak is going to be stored for a long period time, is a zip-top bag sufficient protection, or is additional protection such as aluminium foil needed? 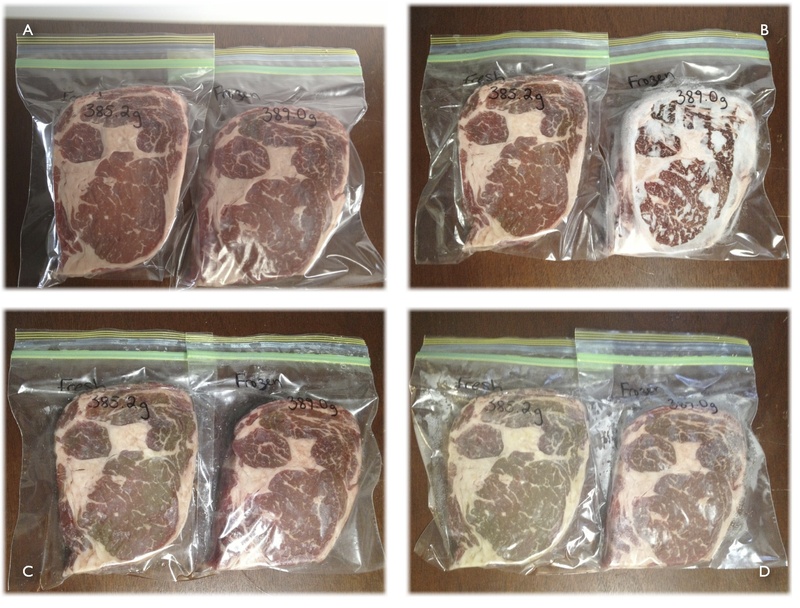 Does moving the steaks from their original packaging to zip-top bags affect on final results? How would either of these techniques fare against proper dry aging? In this case we rested the steaks on a cooling rack above a plate, does this significantly affect the mass loss during resting? On the topic of color, I would be curious to know whether the meat you purchased had been dyed in any way before you bought it. Lots of grocery stores (and similar operations) dye the meat and fish they sell to make it conform more closely to the customer’s idea of freshness. The steaks we used were purchased from a local grocery store which does not package their meats with carbon monoxide, which is commonly used to enhance and prolong the red coloration of meats . The butcher denied the use of carbon monoxide and it looks like all their meats are cut and packaged at the store. I believe him too, since the steaks did brown noticeably after several days in the fridge/freezer, and it sounds like CO-treated meats resist browning even after being removed from their packaging. We would like to do an experiment examining the relative color-aging of CO-treated meats (which should be attainable from Walmart) vs. non CO-treated meats. From an butchers stand point. No one adds color or dye there meat. Duringt transport to help lengthen the life of the meat. A saline solution is added to the meat. Co2 is added to seal the cryovac to protect the meat not to enhance its color. Oxygen is used to enhance the color. I appreciated some of the methods used, but not all: you should have cooked the fresh steak the day of purchase, the only data you would’ve sacrificed would have been one photo. Also I can’t help but critique the photo which showed the cooked products, both steaks lacked proper cooking (no sear). And lastly invest in a vacuum-sealer if you want the best possible results–if you’re going to post an article for the whole world to see wouldn’t it be of seriousness to buy one? Ok as a chef I believe there are a few flaws in this experiment. 1.the cut of meat should be very lean, like filets you can cut from the same tenderloin side by side exact same steaks, same fat, same marbling, same cow. When it comes to mass fat takes up more volume than muscle and fat melts away when cooked resulting in a smaller mass(just like burgers have high fat content they cook up smaller than their original size because the fat melts, also why fattier burgers are jucier). 2.don’t thaw in water, or force thaw, instead set on plate in fridge let thaw naturally. Water turns to steam cooking the meat differently therefore could change the texture and could have a larger mass due to containing excess moisture. 3.use a digital probe thermometer to record the exact internal temperature of the meat before and after. And an infrared thermometer for the pan. Looking at the pics I’d say the fresh steak was cooked closer to medium, and the frozen was medium rare, yes that’s only 5 degrees internal difference but that’s how much longer it was on the flame or a hotspot melting more fat off, thus less mass. 4.measure Kosher salt and oil use same amount on each, salt draws out moisture in meat.